This month's theme is Pancit (Filipino Noodles) chosen by Caroline from When Adobo Met Feijoada Blog and Olive from The Latest Recipes Blog. For this month's theme, I asked for help. Who else better to ask, than my mum. I knew straight away that I was going to make Pancit Palabok as this is my mum's specialty. She is well known amongst the Filipinos around town for her Palabok. When I was in my teens, mum and dad used to have a stall at the Melbourne Philippine Fiesta. In fact, they had a stall at the very first Fiesta back in 1982. In those days, it was a small affair and there were only a handful of stalls, mostly all selling food. My parents sold Longganisa, Tocino, Chicharon to name a few. The week before the Fiesta, the house would be full of wonderful smells from all the preparation for the big weekend. My parents made everything from scratch, including Tinapa (smoked fish). I remember when I used to get home from school, it was my job to scale and gut a whole box full of sardines. 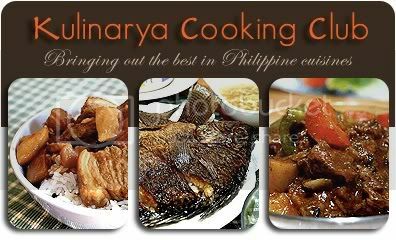 I hated it at the time but looking back, I am grateful that I was exposed to my parents passion for Filipino food. They eventually stopped having a stall at the Fiesta however kept selling Filipino food to the local Filipino community. This is where her pancit palabok really became a favorite among the locals. I am happy to share with you this recipe and part of my family memory. The sauce it the key part of this dish. It has to be flavourful and it needs to be able to carry all the other flavours of the garnishes. This recipe is enough to feed 2 families or as my dad says "enough to feed the barangay(town)". This is the quantity my mum usually makes. In a large pot, boil 5 to 6 pieces of chicken thighs with bones and skin on. Have enough water to use as the stock for the sauce (around 4-5 litres). When cooked, remove the chicken and set aside. When cool, remove the skin and shred meat into small pieces. In another pan, saute 2 medium onions that have been chopped, along with about a bulb of garlic that has been finely chopped. Once it's cooked add two packets (20g) of ground achuete (annatto). Cook further for another 5 minutes. To the chicken stock, add another litre of boiling water, 2 tbl of chicken stock podwer. Add the onion mixture to the chicken stock and stir. Add the shredded chicken. In a bowl mix 300g cornflour and enough water to make a slurry. Add this to the pot and mix well so no lumps are created. Cook the noodles as instructed on the packet. My mum recommends using thin rice noodles. She cooks the noodles by emerging them in boiling water for a few minutes. Remove and place under cold running water to prevent the noodles from sticking together. Your pancit palabok looks super delicious! You are so generous to have shared your parents recipe. It looks so delicious and authentic and much better than those "packet" sauces. I didn't realize that your parents sold so many Filipino dishes... I'd love the longganisa recipe one day! Cherrie your palabok looks delicious. There is so many steps buts worth it at the end. Cheers to another KCC month. I will be back on board next month. Looks really interesting and I am going to try and make this. Can I get Tinapa & ground achuete from Asian grocer? so this is what you were tweeting last week... huh! you're so generous in sharing a family trade secret. this recipe is as good as it gets. so authentic... cravings level: dangerously high! haha! Thank you for sharing your family recipe. I have always used the sachet mix. I will definitely be making them from scratch the next time i make them. Trissa, I've never had the sauce from a packet before. I did post my mum's longganisa http://sweetcherriepie.blogspot.com/2008/01/back-to-my-roots-challenge-9.html I'll probably revisit the longganisa and repost. Penny, Pls make it. I got my tinapa and achuete from a Filipino store, but I'm sure you are able to get it at any Asian grocery store. taga_luto, pls try making from scratch, it really is worth it. Palabok is my most faaaaaavourite thing in the world! We go to Jollibee and I order this straight away! :) I can only use packet mixes as I don't know how to make the sauce, but thanks to you I can finally try making it at home. This is ABSOLUTELY fantastic!!!!! Oh my!!! I started drooling when I saw your post which looks so delicious! I bet you had a good time eating it ;-) Ok, I did say I'm a rice-girl, but palabok & pancit malabon are the only 2 filipino pancits I crave for! Mind if i ask where did you get your tinapa? Cherrie, I have never tried making palabok, thinking it was too complicated. But I will certainly try your recipe. Thanks! Tangled Noodle, I love all pancits too but I have to say that my mum's palabok is my fav :) I hae never tasted it from packet before but I bet fresh is always best anyway. Mommy J, We ate it all up but had to save some for my brother and his family too. We got the tinapa from our local Filipino shop but I've also seen it at Asian grocery stores. Annie, Give this a go, it's really not so complicated. What a delicious specialty! I would love to try pancit palabok! OMG!! You need to tell me where is a goof Fillipino store since I want to make this badly! Anh, The only Filipino stores I know of are in the western subburbs (St. Albans and Footscray) however you should be able to get the ingredients at a good Asian grocery stores. I had pancit palabok for the first time this year (ever) and it was delicious! My mum didn't actually know how to make it but followed a recipe on the packet of the noodles. It didn't look anywhere near as gorgeous as yours but her one had a lot less ingredients.